“Comrades! I am the bard of Democracy,” Walt Whitman announced in a notebook in 1859. Over his 73 years (1819–1892), he essentially made good on that claim. From humble origins in Long Island and Brooklyn, he earned a global audience that never stops growing. On the two hundredth anniversary of his birth he continues to speak to new generations. The exhibition explores Whitman’s process of self-invention, from his early years as a journalist, through the early 1850s when Whitman began to write more privately and poetically, to his final years. Whitman not only sounded a “barbaric yawp” over the rooftops of the world, but he also helped his country to reconcile its famous contradictions through his inclusivity and his extraordinary body of work. Several of Whitman’s notebooks will be on display, as well as his portraitist’s copy of Leaves of Grass (1855) and the famous letter written to Whitman by Ralph Waldo Emerson commending that book. The exhibition will establish Whitman’s unblinking witness to the Civil War and display the great poems that he wrote in honor of the martyred president including “O Captain! My Captain!” Also on view are documents from Oscar Wilde, Hart Crane, Federico García Lorca and Allen Ginsberg, which trace the writer’s influence on the twentieth century as well. The exhibition draws on the Morgan’s own holdings as well as generous loans from the great Whitman collections at the Library of Congress. Walt Whitman: Bard of Democracy is also made possible with generous support from the Gilder Foundation, the Charina Endowment Fund, Joshua W. Sommer, and The Themis Anastasia Brown Fund, and assistance from The Gladys Krieble Delmas Foundation, Susan Jaffe Tane, and Christian Keesee. 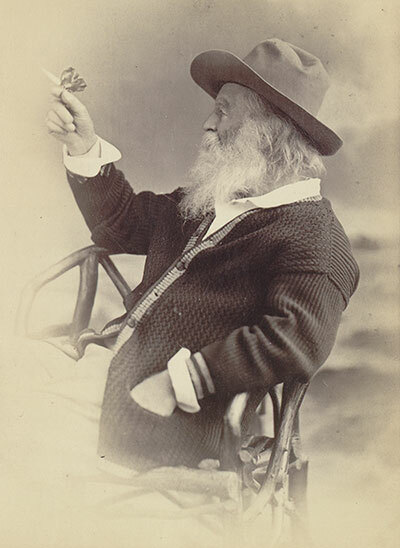 Phillips & Taylor, Photograph of Walt Whitman, 1873. Prints and Photographs Division, Library of Congress.